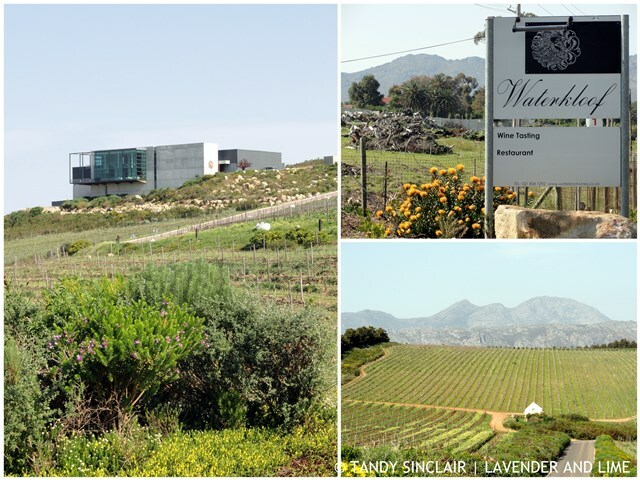 Situated 11 kilometres from our house, The Restaurant at Waterkloof Wines is our destination of choice when dining out. This year we have enjoyed Greg’s food on 6 occasions at the restaurant as customers and once as members of their wine club. The wine club event was hosted by Paul Boutinot who refers to himself as the custodian of the estate. Paul explained how he wanted specific factors when choosing where in the world to grow his grapes and make his wines, and I for one am extremely grateful he chose the slopes of the Schapenberg Mountains. These are the mountains I gaze upon from our balcony at home. 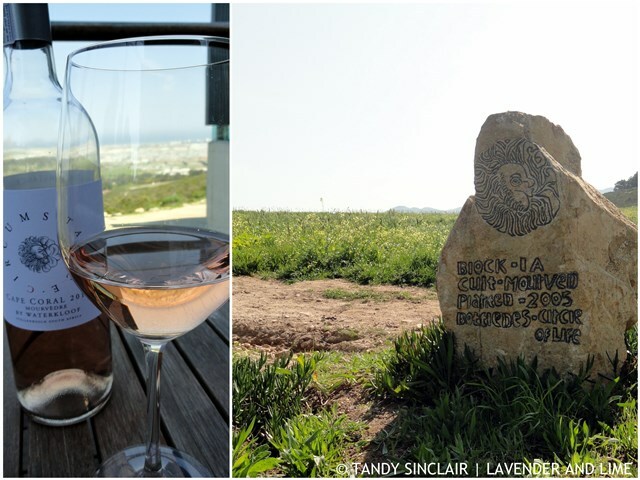 This post is about my Wine Tasting At Waterkloof experience. 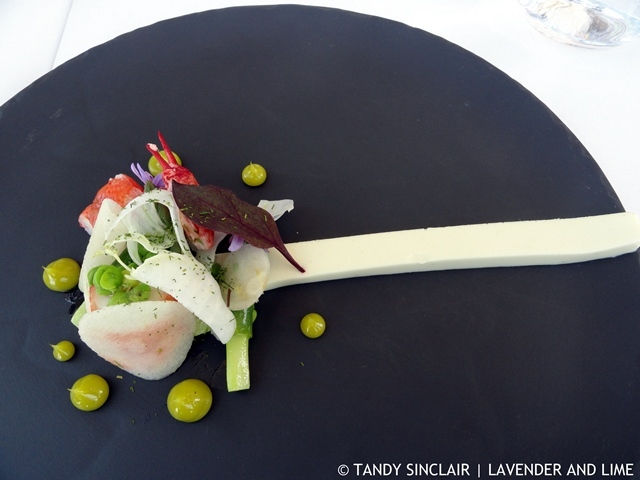 I was invited to a media lunch and it is the first time I have been to Waterkloof as a blogger. This offered up a unique experience for me as part of the day included a cellar tour, something I have not done before. While waiting for everyone to arrive we sat on the balcony overlooking False Bay on the new couches designed by Greg. We were offered the Circumstance Cape Coral 2014 to sip on. This rosé wine is made from Mouvèdre grapes and is naturally acidic with hints of strawberry and a very floral nose, hinting at the fynbos that grows all over the estate. I am currently savouring the 2011 vintage at home, often using it to marinade venison. The next wine we were offered was the Seriously Cool Cinsault 2013. The term seriously cool relates to the wind and climate at Waterkloof, but to me this is a seriously cool wine and one of my favourites. It is dry with spices and licourice on the palate. Accompanying the wine were ploughman’s platters. 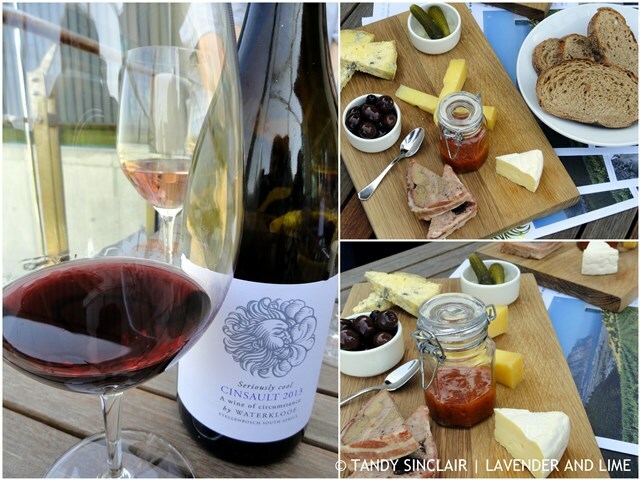 These platters are served in the tasting room which is open from 10h00 to 16h30. Wine tastings start from R30 and the platter costs R130 and will easily satisfy two people. It comes with pork terrine, a variety of cheeses including Healey’s Cheddar, chutney, pickles, preserves and olives. Chat to Zandri in the tasting room for more information. Nadia Barnard, the winemaker and cellar master at Waterkloof, loves the diversity of her work and it shows in her enthusiasm when she talks about what she does at the estate. Nadia showed us around the cellar, explaining in detail the ethos of wine making at Waterkloof. At Waterkloof, each block is separately fermented before blending. 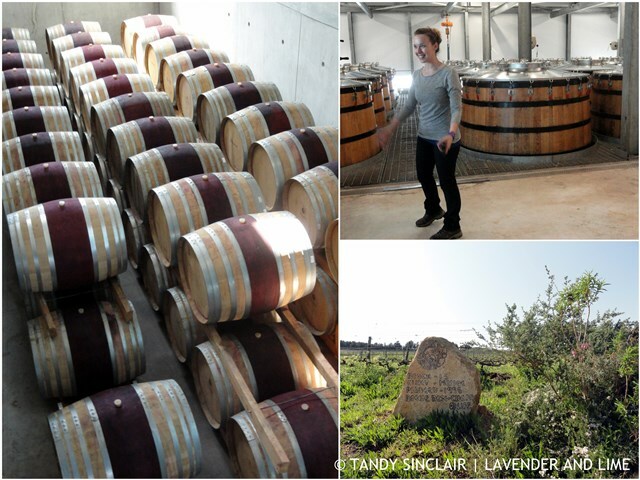 About 30% of the wines are barrel fermented and the Rhone varietals are treated differently to the Bordeaux wines. I will go into this in more detail in a separate post as the entire process is extremely interesting. In the cellar we tasted the Circumstance Sauvignon Blanc 2014 which is grown on the south facing, slightly warmer slope of the Schapenberg. The wine has a very mineral nose and peach on the palate. 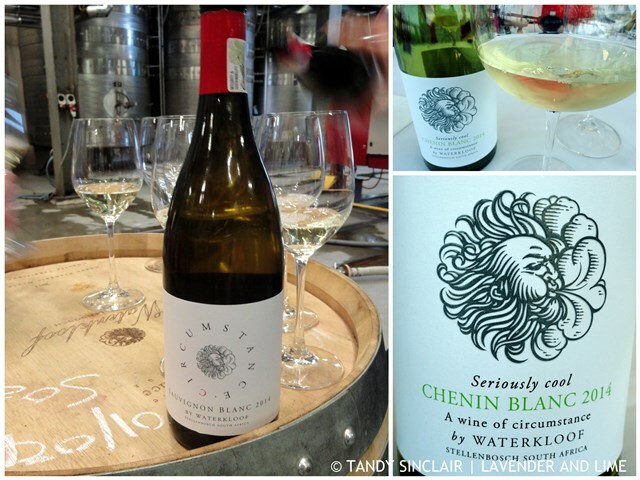 Our first wine with lunch was the Seriously Cool Chenin Blanc 2014. I love that the label states that this is a wine of circumstance which ties it in to the Circumstance wines. This wine has excellent stone fruit on the nose and a crisp finish and is my second favourite of the whites from the estate. My first being the Viognier which has a lovely lemon hint to it, which we tasted at the One & Only dinner where Ruben collaborated with Greg to showcase Waterkloof. Lunch was to showcase the spring menu that we can expect from Greg in the coming months, but as it is still not quite spring I expect that some of these dishes will change. Our amuse bouche was seared duck with an Asian broth and radish. This was then followed by poached marron and langoustine served with a very light fennel panna cotta. We were then given the maiden vintage of the Circumstance Cabernet Franc 2012 to accompany braised lamb with a hint of Moroccan spices. This varietal is grown on a site which has moderate temperatures and is picked early and then barrel aged for 15 to 18 months. It is full of black pepper on the nose. This course was followed by a pre dessert and then dessert was served. A pineapple curd with guava foam and avocado ice cream. I ended my afternoon with a single espresso and some petit fours. 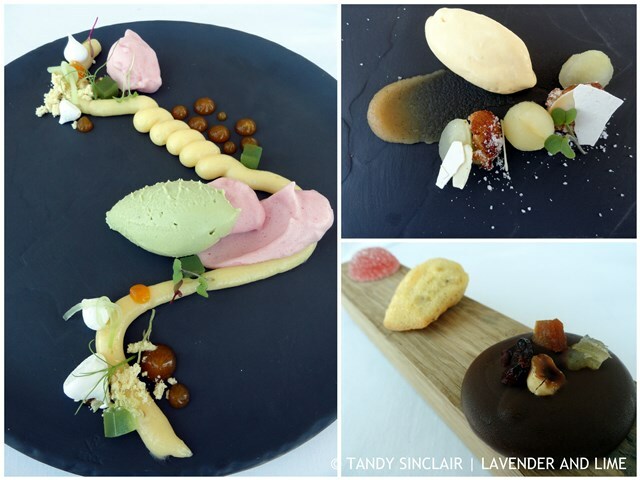 I hope that this will encourage you to take a drive to Waterkloof and sample some if not all that they have to offer. 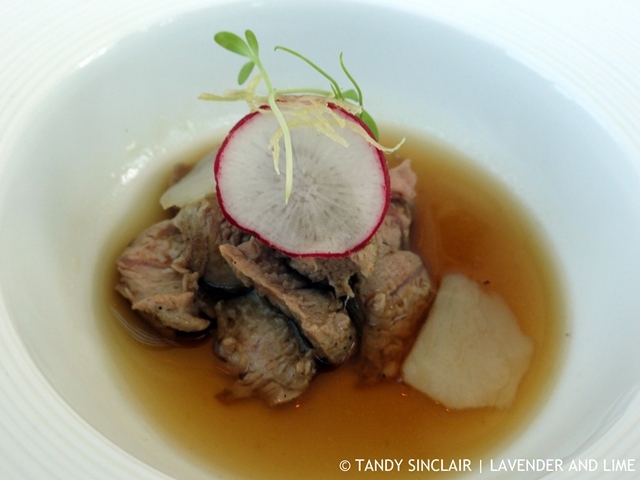 Tandy, such gorgeous scenery and the seared duck with Asian broth and radish looks delicious! Looks like it was an enjoyable day out. Hopefully we can make it to South Africa one day! You are just teasing me now. You know how I long to visit this place. I didn’t realise you were only 11 km from it’s front door. Seriously pretty food to go with great wine. Looks like a delicious meal, I’d love to try the pineapple, guava and avocado dessert. That’s 10,800 km for me to visit. LOL! Looks fabulous, especially those sweet platters, I love how pretty and placed the meal is. Lucky you having this as your local. Well worth it LOL 🙂 We are very blessed indeed! Ooh, Tandy! I love wine tastings such as this. Your sweet endings look all good. I love the styling they did there. Great experience, thanks for sharing! What a great experience! That avocado ice cream dish is especially stunning! Thanks Rachel, we are very lucky! 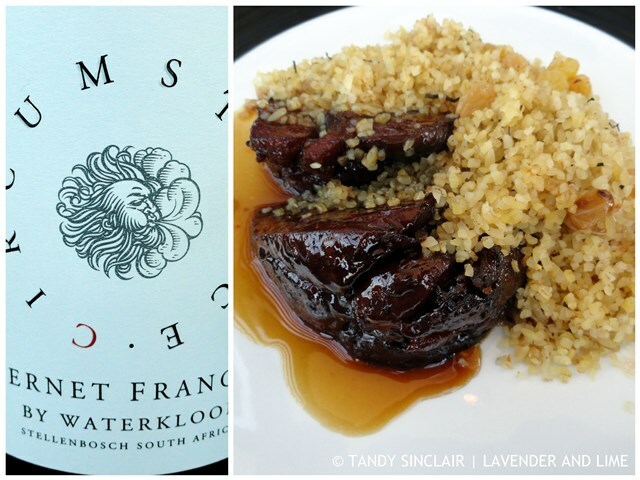 Hi Tandy, dining at the Waterkloof sounds divine. The surrounding area is beautiful, I could get used to that. This looks like such a delicious little winery. I have never tried their wines but their menu looks so good. You are making me hungry and I just finished dinner.. I love the petit fours! Sounds like a great visit, we were given a bottle of Circumstance Sauvignon Blanc the other day, what a treat! What a wonderful day you enjoyed! Have a happy day Tandy.